Battlefield 3's launch was plagued with online issues, blocking gamers from going online with the popular multiplayer shooter, booting others and causing wide-spread server issues. But in an interview this morning with Kotaku, Electronic Arts says that after shipping 10 million copies of the game and having more than 2.2 million players log in to play, they think most of the online problems are behind them now. "We are happy to report that PS3 and PC players experienced server stability all weekend, and Xbox 360 servers are at 95 percent and climbing," an Electronic Arts spokesperson said in response to Kotaku's emailed questions. "There were a number of different factors that impacted server connectivity across the platforms. Regardless of the cause or platform, our Online teams are standing by to identify the issues and addressed them as they arise. We will not rest until we're at 100 percent." The PC version of the game ran into issues with its use of Punkbuster anti-cheat software, a problem that EA tells Kotaku has since been fixed. "Punkbuster is not new to EA games, nor is it limited to PC titles," the spokesperson wrote. "We are always evaluating technology partners in order to deliver the best possible consumer experience, but Punkbuster provides the a great balance between effectiveness and user friendliness." 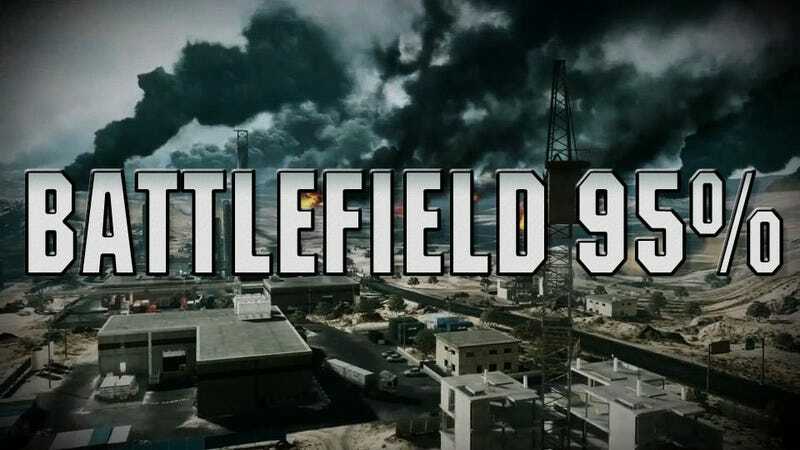 The Xbox 360 version of the game seems hardest hit, with EA acknowledging early this morning that problems still exist for some gamers trying to get into Battlefield 3 matches on the Microsoft console. "There are a number of different factors impacting server connectivity on Xbox 360," the spokesperson said. "It is a particularly complex server architecture and we continue to work with Microsoft to improve connectivity. Our Online teams are standing by 24/7, identifying issues and addressing them as they arise. We are gamers, too, and understand how frustrating it is not to be able to play the game without interruption. We appreciate their patience and promise, it will be worth the wait." Part of the issues seemed to be caused by the high number of people going online to play Electronic Arts' game. More than 2.2 million people logged in to play Battlefield 3 in the first 24 hours and over the weekend, we were told. "Peak Simultaneous Users set a new single title record for EA," they said. While acknowledging the rocky kick-off for their game, Electronic Arts refuted any suggestion that their new Origin online service was a central part of the problem. "Origin is still a new service platform that, even in these early days, is off to a great start," the spokesperson said. "In the first 48 hours of launch, a small amount of Battlefield 3 PC players using Origin experienced an authentication issue. This is a known issue which has now stabilized. We continue to monitor the situation and are standing by to quickly resolve any future issues that might arise." "At a high level, the tech process has been: identify, hypothesize, reproduce, fix, test, publish, verify and communicate," they said. While the solution seems to have cleared things up within the first weekend of the game's release, I asked Electronic Arts why it happened in the first place. Afterall, the company were tracking their high pre-order numbers and ran an extensive beta that led to a myriad of last-minute fixes. "The game is spectacularly popular," they said, in response. "We've shipped 10 million units, sell-through is good and we are already receiving re-orders. The key feature for most players is the incredible (multiplayer) experience. With such huge interest in the game, demand outstripped even our best expectations coming out of the beta. This is an evolving process that we are committed to improving. Even with a successful beta, systems under load will reveal new opportunities for optimization and improvement. When we see those opportunities, we would rather move immediately and create short-term inconvenience (maintenance period) to improve the long-term experience for all players." With a mostly hitch-free weekend, according to Electronic Arts, the team now things they're over the hump in terms of Battlefield 3 problems. "We've turned a corner," the spokesperson said. "We had a great weekend with solid server stability on PS3 and PC. Xbox 360 servers are at 95%, as a small percentage of people are experiencing intermittent volatility which we are addressing. We believe that the major issues are behind us, but our Online teams will not be happy until we're at 100%. We continue to work on solving for each issue." Do they plan on trying to do anything to make up for those early issues with the game? No. "We are always looking at ways to generate customer satisfaction and our number one road to their happiness is to get everyone playing smoothly and ensure 100 percent stability.," they said. "We are gamers, too, and we understand that no gift will match the experience of getting in the game and playing with friends." How has your Battlefield 3 online experience been? Let us know in comments.